Chazuke (or ochazuke) is a simple meal made by pouring green tea, dashi (cooking stock), or water over cooked rice with savory toppings such as grilled salmon, umeboshi (dried plum), seaweed, tsukudani (seafood boiled down in soy sauce and mirin), tarako (fish roe), and tsukemono (pickles). 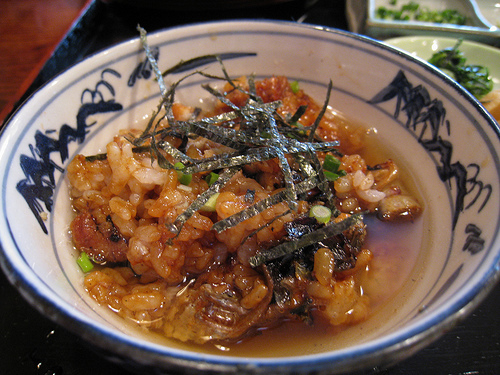 Because it is such a simple dish, chazuke is rich in variety, and you can find unique chazuke in each region of Japan. 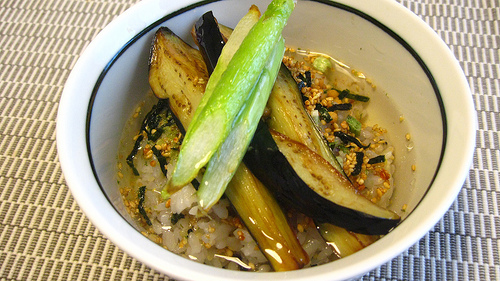 “Funazushi Chazuke” is eaten in Shiga Prefecture. Funazushi is old style fermented crucian-carp sushi, and it has strong odor. The orange thing in the dish is carp roe, of which taste and texture are similar to cheese. “Hitsumabushi” has eel fillets cooked over charcoal with teriyaki sauce. It is often eaten in Nagoya, Aichi Prefecture. “Hiyashi Chazuke” is cold chazuke topped with vegetables. Good for summer. 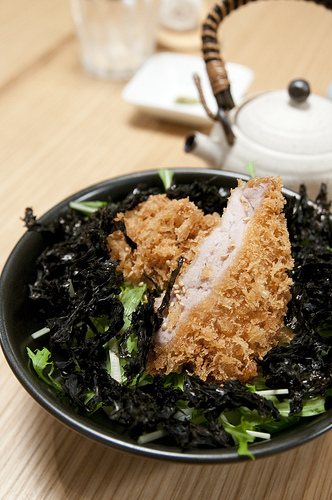 “Tonkatsu (deep fried pork) Chazuke” is served at some restaurants in Tokyo. It sounds strange but many people who ate the dish found it delicious. One of the strangest chazuke toppings is manjuu, a sweet bean-jam filled bun. “Manjuu Chazuke” is made of manjuu, rice, and hot green tea. It is known as a Japanese doctor and novelist, Mori Ogai (1862-1922)’s favorite food.